In interstellar terms, a ‘fast’ mission is one that is measured in decades rather than millennia. Say for the sake of argument that we achieve this capability some time within the next 200 years. Can you imagine where we’ll be in terms of telescope technology by that time? It’s an intriguing question, because telescopes capable of not just imaging exoplanets but seeing them in great detail would allow us to choose our destinations wisely even while giving us voluminous data on the myriad worlds we choose not to visit. Will they also reduce our urge to make the trip? Webster Cash, an astronomer whose Aragoscope concept recently won a Phase I award from the NASA Innovative Advanced Concepts program (see ‘Aragoscope’ Offers High Resolution Optics in Space), has also been deeply involved in starshades, in which a large occulter works with a telescope-bearing spacecraft tens of thousands of kilometers away. With the occulter blocking light from the parent star, direct imaging of exoplanets down to Earth size and below becomes possible, allowing us to make spectroscopic analyses of their atmospheres. Pool data from fifty such systems using interferometry and spectacular close-up images may one day be possible. Image: The basic occulter concept, with telescope trailing the occulter and using it to separate planet light from the light of the parent star. Credit: Webster Cash. Have a look at Cash’s New Worlds pages at the University of Colorado for more. And imagine what we might do with the ability to look at an exoplanet through a view as close as a hundred kilometers, studying its oceans and continents, its weather systems, the patterns of its vegetation and, who knows, its city lights. Our one limitation would be the orbital inclination of the planet, which would prevent us from mapping every area on the surface, but given the benefits, this seems like a small issue. We would have achieved what Dan Goldin described. At 100 light-years, something the size of a Honda Accord — which I propose as a standard imaging test object — subtends an angle of a half-trillionth of a second of arc. In case that number doesn’t speak to you, it’s roughly the apparent size of a cell nucleus on Pluto, as viewed from Earth. You will not be stunned to hear that resolving something that minuscule requires a telescope with a honking size. At ordinary optical wavelengths, “honking” works out to a mirror 100 million miles across. You could nicely fit a reflector that large between the orbits of Mercury and Mars. Big, yes, but it would permit you to examine exoplanets in incredible detail. I doubt we would do that, however, because we can hope that among the many worlds such a space-based array would reveal to us would be some that fire our imaginations and demand much closer study. The impulse to send robotic if not human crews will doubtless be fired by many of the exotic scenes we will observe. I wouldn’t consider this mammoth space array our only way of interacting with the galaxy, then, but an indispensable adjunct to our expansion into it. Image: An early design for doing interferometry in space. 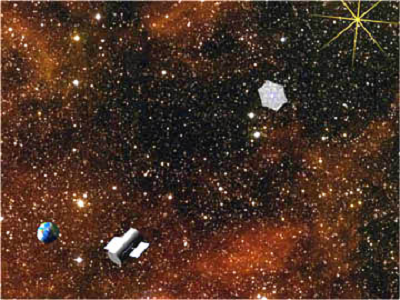 This is an artist’s concept of the Terrestrial Planet Finder/Darwin mid-infrared formation flying array. 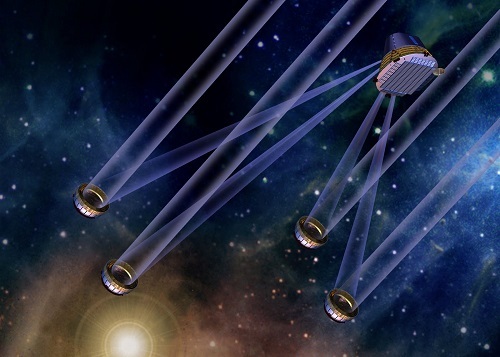 Both TPF-I and Darwin were designed around the concept of telescope arrays with interferometer baselines large enough to provide the resolution for detecting Earth-like planets. Credit: T. Herbst, MPIA). All this talk of huge telescopes triggered the memory of perhaps the ultimate instrument, dreamed up by science fiction writer Piers Anthony in 1969. It was Webster Cash’s Aragoscope that had me thinking back to this one, a novel called Macroscope that was nominated for the Hugo Award in the Best Novel Category in 1970. That’s not too shabby a nomination when you consider that other novels nominated that year were Ursula Le Guin’s The Left Hand of Darkness (the eventual winner), Robert Silverberg’s Up the Line, and Kurt Vonnegut’s Slaughterhouse Five. The ‘macroscope’ of the title is a device that can focus newly discovered particles called ‘macrons,’ a fictional device that allows Anthony to create a telescope of essentially infinite resolution. He places it on an orbiting space station, from which scientists use it to discover exoplanets, observe alien races and even study their historical records. The macroscope is also a communications device used by intelligent aliens in ways the human observers do not understand. When a signal from a potential Kardashev Type II civilization is observed, a series of adventures ensue that result in discoveries forcing the issue of human interstellar travel. So much happens in Macroscope that I’ve given away only a few of its secrets. Whether the novel still holds up I don’t know, as I last read it not long after publication. But the idea of a macroscope has stuck with me as the embodiment of the ultimate telescope, one that would surpass even the conjectures we’ve looked at above. Anthony’s macrons, of course, are fictional, but complex deep space arrays and interferometry are within our power, and I think we can imagine deploying these technologies to give us exoplanet close-ups as a project for the next century, or perhaps late in this one. What images they will return we can only imagine. So many of our troubles today would doubtless evaporate if instead of looking inwards at our differences and fighting each other over them, we looked outwards to see a much, much bigger picture. Though I’m not necessarily a fan of the tactics employed by nation builders such as Otto von Bismark and Giuseppe Garibaldi, these gentlemen understood this and engendered through their cunning, the creation of two great, modern nations. Remarkably, perhaps we might make for ourselves a similar, unifying opportunity. As a member of the Murchison Widefield Array, radio telescope community, I am familiar with the emergent capabilities and issues surrounding terrestrial, low-frequency interferometric arrays but haven’t kept abreast of the near-term potential for realisation of instruments such as the TPF, in whatever form recognised today as most promising. However, were interested parties able to rouse governments around the world to support creation of an instrument capable of imaging worlds beyond our solar system by each adopting and funding a single component mirror, singly or together with others, perhaps the project could ‘fly’. Many, many nations would then have ownership of what would surely rank as one of the most significant endeavours ever. School children would talk to each other across borders and together imagine together the discoveries that might be accomplished. We would have something big in common. For the science community however, the risks would be enormous. We’d need to throw away traditional rivalries and notions of natural leadership, we’d need to be quite confident in the capabilities of such an instrument and most of all, we’d need to promise that the telescope would be built, on time and on budget. Naturally, a few nations would provide leadership through the knowledge and technologies that they would provide and for those countries, sharing ownership equitably might be politically impossible. Those familiar with the costs and logistics of operations in space might regard this concept as quite naive… and it might be. However, the rewards too would be enormous. A good friend living in Mumbai, India, an engineer who has a passion for helping local school children gain insights into the world of science, is constantly astounded and delighted by the responses of her charges to the opportunities for expression that her classes provide. She acts out of her deep desire for children to be given the opportunity to experience a world that we take for granted. Surely, everyone on Earth having some stake in such a project would result in enormously positive outcomes, not least of which being the astounding advance of our knowledge of the universe (even if out to only 100 ly lol). Food I hope, for thought. Even assuming that a perfect telescope of this size could be built it would not achieve the “theoretical” resolution. EM scintillation in the ISM would impose a limit. But I don’t know if anyone has done the calculation. The resolution limit would vary by direction and distance and wavelength. The new telescopes have completely turned around astronomy. We actually can imagine seeing photos of alien continents and biospheres within our lifetimes which is an amazing thing to consider. Science Fiction almost always imagined interstellar travel first then discoveries of alien planets upon arrival, and lately I have heard SF authors jokingly complaining that exoplanet discoveries make their job more difficult. Personally I can recommend also the fascinating novel Blind Lake by Robert Charles Wilson which touches on future imagined telescope and consequences of such discovery. The above article of course gives us some data for Fermi Paradox. It is now rather obvious that any advanced civilization would be able to detect our planet, biosphere and civilization since considerable length of time(biosphere since billions, civilization between around 2000 to 200 years from today).This silences the objections to sending messages into outer space that are sometimes voiced as warnings, but it also means such messages shouldn’t be really necessary. Of course this also means that if they exist most likely they know of our existence-leaving the question-why don’t they want contact? Personally I believe that due to time difference, as millions of years of evolution both technological and biological will make them unable to communicate with us or at least without us losing our unique culture and development. Of course there is also the possibility that they simply faded away or never existed at all. Still, we should have tools to provide some answers soon-at least within next 50 years. Until we can get ships to velocities closer to the speed of light, telescopes are much much more interesting to me than interstellar probes. For me it is even hard to choose between massive telescopes and interplanetary missions that might discover life. As daunting as some of these telescopes seem, they seem much more achievable than getting close to the speed of light right now. If we could directly image an earth “twin”, even if it is just a pale blue dot, it would be incredible to me. There would be a certain easing of cosmic loneliness that would be priceless. As exciting as the current exoplanetary discoveries are to me, I want to be able to observe something more direct. If we could get even closer to be able to say, look at a (hopefully) green continent sitting in a blue ocean… wow. The level that is talked about in this article, basically getting a google maps view of a life bearing planet, well I don’t think I can come up with the appropriate adjectives. Of course, it may be likely that nothing within a 100 light years will bear obvious life forms, but still, the gamble seems worth it because of all the other discoveries we would make. Would anyone venture a guess as to how long it would take to build a device of the size that Shostak proposes? Personally, I think it should be the next LHC style project. The effect of seeing a green exoplanet with continents would be galvanic – there could be no more certain way to focus humanity’s attention upon our stellar neighbours than this. That is why such ambitious telescopes are important for all of us. I’m a fan of Maccone’s grav scope (using our own sun as a gravitational lens). Has anybody produced simulations of the sort of images which could be extracted from such a device? So, it seems that detection of all the city lights of a planet is barely theoretically possible with a really large regular telescope and longish exposure times. But what if you want to resolve an image? That Honda you want to make out probably has an area about 10^-12 smaller than that of the entire planet, and the number of photons you would get from it would be correspondingly less. An aperture of roughly 10^16 m would be necessary, i.e. the total mirror area would be 10,000 times that of the Earth. And because this is about light gathering power, not resolution, there is no cheating with interferometry. That should be 10^16 square meters (not meters) there near the end …. So if we wanted to realize that 1-Honda resolution telescope as a formation-flying swarm of (relatively) small elements each with a 1 m mirror, we’d need to fly 10^16 of them, or 10 million billion. Talk about big budgets…. A quick question to those who know: assuming you had the resolution you need to resolve a honda accords @100ly, would you actually collect any photons to image it? Whay kind of physical collection area do you need to actually capture optical-wavelenght photons from an object that far-away? There must be some fundamental limits on what you can see at particular distance, no matter how big the collecting area? @ljk (from previous thread) It is SO frustrating to have just one data point for something so important. To me this is why the telescope will not supplant the space probe. To study biology and related fields, we will need to send a probe to the life bearing exo-planets. A telescope can point the way, but it will not be sufficient to study the planet. The notion that telescopes will obviate probes it patently absurd. To the contrary, better telescopes will always increase the motivation for a probe. Whatever a telescope may show will always cry out for a next step of investigation, and there are many things no telescope could ever show. Imagine we have a super-scope that shows an exoplanet at the level of detail that Schiaparelli and Lowell saw Mars at. What if someone decided it looked like there were canals? Does anyone really think that there is a level of resolution at which all important questions can be answered? Think again…. Depends on how fundamental you want to get. If you only take the diffraction equation and photon number into account, you could arbitrarily increase resolution by increasing baseline, and arbitrarily increase sensitivity by increasing collection area or exposure time. However, on the next level of practicality, I am pretty sure that there will be decoherence due to varying conditions in interstellar space or near the detectors, which could put a strict (nearly fundamental) limit on how large the baseline can be. And the inevitable presence of unrelated photons will put a limit on sensitivity simply because the few photons that come from the target drown in the noise. I fully agree with Eniac’s last comment. Just to follow on from the life questions, how could a telescope answer questions of biology – origin of ET life, underlying biology of metabolism and replication, etc, etc? High resolution telescopes will create a sense of being “nearly there”, unable to “touch” the planet. Just like TV and movies can drive tourism, these images will drive the demand to send a probe, which will stimulate propulsion research to shorten the travel time. Looking back now, perhaps we could take this even further and eliminate having to be at any particular distance from our points of observation by, in some way, utilizing quantum channeling into the past via teleportation ala P-CTCs. Hopefully, in the next 200 years we’ll be at a technological level to do that. So then the challenge (or opportunistic excuse) arises: even if we look and don’t find any life crawling on those planets we observe, we can’t rule out that life may have at one time existed there (considering the rate at which species go extinct on our own planet)–and we would be able to definitively verify by observing the entire history of the planet’s existence in its system. We should also consider how our development in better understanding of biophotonics and EBCs would influence any observations of biological information and macroscopic phenomena. To avoid confusion, the correct acronym is BECs, standing for Bose-Einstein condensates. Other papers featuring Byrnes may also be highly interesting to some of you. I have read all over the internet that there is a theoretical hypertelescope that has an aperture of 1 AU and could resolve a 2 meter object at 100 ly’s. I have looked in vain for the equations that would allow me to calculate different resolutions at different distances via arrays of different sizes. My extreme example – cost and mass prohibitions aside – is what resolution could be discerned at 1000 ly’s given a hypertelescope of a size slightly greater than Jupiter’s orbit, say 1 billion miles? Would enough photons be captured to resolve any exoplanet at that distance? Any guesses would be very welcome; or links to the underlying math so I can figure it out myself (be tender with me: I am a writer, not a physicist! ).